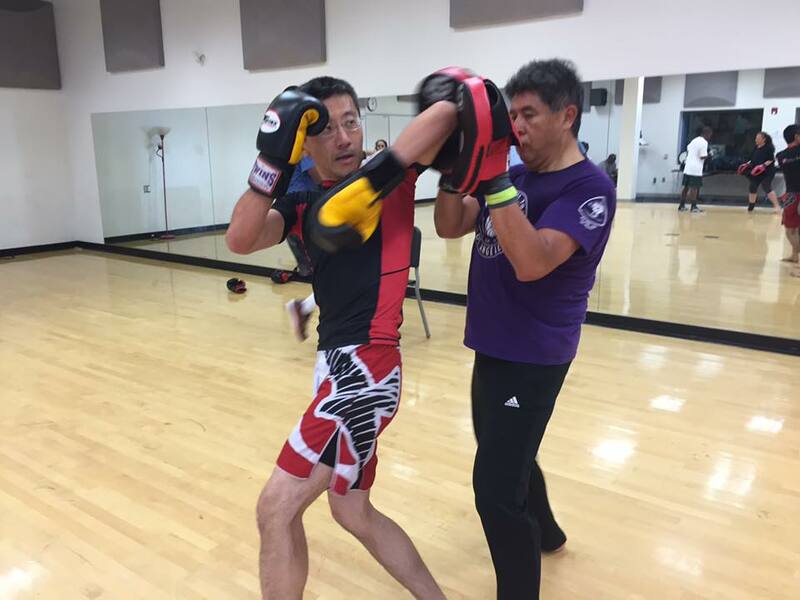 My experience spans almost 30 years in both traditional and modern martial arts, including Jeet Kune Do, Muay Thai, Savate, Brazilian Jiu-jitsu, Combat Kung-Fu, Kali/Escrima, Krav Maga, Tae Kwon Do, Hwa Rang Do, & Tang Soo Do, covering all different ranges of combat. I also emphasize the proper mindset and philosophical aspects of training as well as the physical movements, as my goal is to help my students realize their potential as individuals first, and martial artists second. Michael Ha Is the best at what he does and it is an honor to train under him. He creates an environment where his students feel safe and supported. Whether you come in as a beginner or with more experience, he will get you to the next level. His technique demonstrations are clearly communicated and easy to follow. I have primarily trained Muay Thai under him. I had an amazing experience with Michael. I’ve worked with him in both JKD and Muay Thai. He always pushes his students to their full potential. He’s a stickler for technique and understands that without proper technique, it doesn’t matter how strong you are. With that being said, I always feel like I get an AMAZING workout with Michael and have never felt stronger or more toned. Sifu Michael is great. Very patient and works with all, no matter what skill level. Sifu Michael is an easy going, awesome instructor! It's obvious he's an expert in the styles he teaches. His instructions and demonstrations are clear, concise and easy to follow. He manages to keep things fresh by frequently introducing something new. He also reviews earlier material to make sure you become a proficient and well rounded fighter. Sifu Michael emphasizes the use of proper technique and self control so you don't injure yourself or others. I always leave class feeling like I've worked hard, learned something new, and improved my skills. I've had other martial arts instructors before. The difference is that Sifu Michael's classes are fun, without sacrificing the dedication and commitment to the art! I have trained with Sifu Michael for six years and will continue for many more. He is very personable and extremely knowledgeable in a wide variety of martial arts. Sifu Michael has trained with many of Bruce Lee’s original students and provides a direct lineage in Jeet Kune Do instruction. His classes can be enjoyed if you have no martial arts training at all or if you have been practicing for years. Highly recommended! I have been training with Sifu Michael for almost five years. He is a fantastic instructor - patient and knowledgeable. Classes are always a lot of fun too! I have been working with Sifu Michael for seven years now. He has taken me from a jittery-over-eager-people-pleaser to a calmer, confident, and more strategic self. He works wonderfully with all levels and has an unbelievable depth of knowledge. Even when I’m working with beginners during class he has a way of ensuring I get a meaningful lesson and that the beginner across from me is comfortable and secure AND still getting a useful and exhilarating lesson. It takes more than a good martial artist to be a good teacher and Sifu Michael is the whole bag. I’ve studied many places and keep coming back to Sifu Michael to learn more. An overal generous and gracious teacher capable of taking anyone to a deeper level of understanding of their body and mind in a martial setting. My brother and niece have worked with Sifu Michael at another school and recommended Sifu Michael when he opened his location in West Los Angeles. I’m a low key person looking for a matching training environment. Sifu Michael is a patient, highly trained and a very practical instructor and has exceeded this noob’s expectations! The students are all very friendly and know when to gauge another student’s skills in practice or sparring so nobody gets hurt. Don’t get me wrong, everybody gets some serious exercise and you gotta watch those jabs and crosses! I like to find out the student's goals, past/current level of experience (if any), and health/injury history so I can best assess if I can offer him/her what he/she's looking for. My first lesson is always FREE, so we can meet, do some training, and we can go from there if it seems like a good fit. I usually have a sliding scale, depending on whether it's a group or private/semi-private lesson, whether I'm driving to them or they are driving to/near me. I don't do contracts or memberships, but similar to what a lot of yoga studios do, if you buy more lessons up front, then the lower the rate per lesson will be. I've worked with all kinds of students, from seasoned martial artists (Black Belt level or equivalent), to newbies who've never taken one martial arts class ever but are looking to start. My students have also varied in age from 6-year olds to 72 year-olds, and from marathon runners to sedentary individuals looking to get in shape for the first time.